Actually this was a feature request and we committed a change. So it should be visible in the 0.4.12 rls notes. I changed the title accordingly to better reflect what we did. 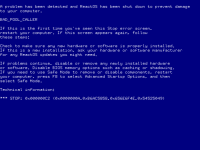 ReactOS fails to install the new version of VirtualBox Guest Additions, it doesn't occur in older VirtualBox versions. After the crash, Guest Additions are not properly installed. The new VirtualBox Guest Additions are working fine under Windows Server 2003 and Windows XP. Just insert the VirtualBox 6.0 Guest Additions image and attmept to install it.